With the beginning of every fall semester comes the busiest week of the school year — and that leads to many parking problems, said . Fitzpatrick said this large influx of students who typically try to park in two or three parking lots causes congestion and rule-breaking for the first few weeks of every semester. Fitzpatrick said he doesn’t expect many issues after students have a chance to get accustomed to the campus. “It usually pans out in about a week,” he said. He said students will be expected to know and follow the parking rules from day one. “The campus isn’t going to go to tremendous extents to create … parking just for a couple of days out of the year,” he said. Fitzpatrick said the most common violations of campus parking rules involve students parking where they should not. “The most significant [violation] is parking in faculty spots,” he said. The other issue is when students create parking places.,Fitzpatrick said. “When it’s not a designated spot, they just park — against curbs, on the grass, extending the parking lines out past where they’re supposed to be,” he said. Fitzpatrick said students who block traffic or other areas by parking in no-parking zones may risk being towed if they can’t be located to move the vehicle. Fitzpatrick said students also need to be aware of traffic laws such as one-way lanes. “… People will be driving up and they’ll see a spot open up, and they’ll go the wrong way on a one-way,” he said. Of the parking violations, Fitzpatrick said, parking in a handicapped spot is one of the least common he sees — likely because of its hefty fine. “[The fine] can range anywhere from $250 to $500, depending on whether you get a city citation or a county citation,” he said. 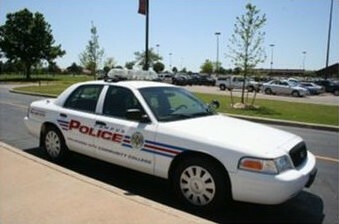 The cost of fines for all parking lot violations can be found on the OCCC Police Department’s Traffic Parking brochure, available in the Police Station on the first floor of the Main Building or online at www.occc.edu/police/pdf/TrafficParkingBrochure.pdf. To help ease parking confusion, Fitzpatrick said, students can follow @OCCCParking on Twitter. He said it is a valuable resource more students should take advantage of. “We keep them up-to-date when the lots are full, so on their way here they can get an idea of what kind of luck they’re going to have,” he said. He said he hopes resources such as the OCCC Parking Twitter account can remind students that OCCC has significant amounts of parking which goes unused. “It seems that no matter how much [we] try to stress to [students] that there’s ample parking in D lot, E lot, F lot, they still just drive around A, and C and B lot looking for parking places, when they could go around there, park and walk in,” he said. He said there are a number of places students can go to find more information about OCCC’s parking places and procedures. “You can go to the (college) webpage and pull up the campus map that tells you where the parking lots are,” he said. For more information, contact the OCCC Campus Police Department at 405-682-7872, visit www.occc.edu/police, or visit the office located on the first floor of the Main Building.